The first written mention of the house is the one of 1535. Then it was the property of Valentin Hibel. 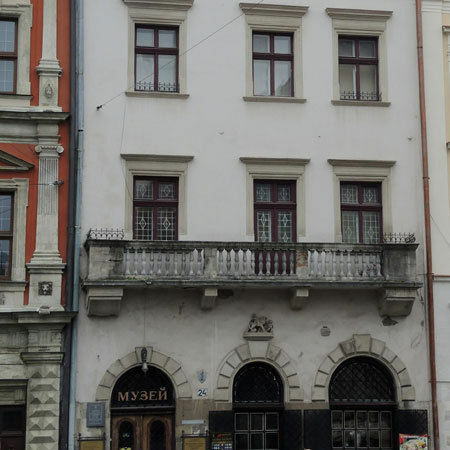 In 1569, his heiress Kateryna Hiblova married Stanislav Schultz, and the house became the property of Schultz family. Later, when Dorofeya, daughter of Wolf Schultz, became the wife of the consul of Venice, Antonio Massari, the stone house became known as Massarivsky. At the beginning of 20th century, in memory of Antonio Massari, a picture of a winged lion – the symbol of Venice, was set above the stairs of the ground floor, and on the facade of the house above the window was placed a sculptural group: a lion and two putti, one of which rides the lion, and the second leads him.In late 1680s, a Scotsman Thomas Gordon lived in the house. In 1672 – 1682's he was a member of the 40 Men Board, and later – a member of the Council. In 1694 became the owner of the house. After his death (1720(?) – 1723(?)) his heirs lived here. In the second half of the 18th century the house belonged to Sheptytsky family.In 30 – 40’s of the 19th century there was a confectionery of Hanneman. Later, in 1875-1901 there was a bookshop of Seifart and Tchaikovsky in the house.By the time of its existence the house has undergone numerous reconstructions.At the beginning of the 20th century (around 1920) the building was reconstructed: the third floor was added and crowned with modern pediment and a bas-relief (creator Z. Kurchynsky), the places of doors and windows of the ground floor were changed. In 1946 ownership of the building was passed to Lviv State Museum of History.